Sven reminds me of a young teenager, while monahan is basicly a young man. 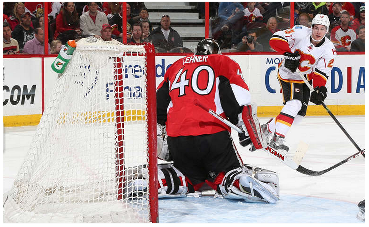 Last night's game is a indicator of something we may see more of in the future from Mony. I listened to Hartlry and Mony's pressers about what he did on his break. While most player's they spent time with family, Cammi and Gio played golf with Delaet at phoenix, relaxed and took a break. Sean did the same but worked hard in the gym strength training and skating. Now ask yourself's how many 19 year old's would dedicate themselves to working on improving their skills on a break. The differance between good and great is the desire/ work ethic to improve. Sean has the mental toughness and drive to excel where Sven and Backlund did not at that age. He is working hard at his faceoffs too. I see some improvement in FO's where it would normally take others years to get results. In fairness to Baertschi though, I think it's more of a situation that Monahan is just that mature and not a case of Sven being immature. Let's not rip Sven here just because Monahan is that good. If Monahan had not gave gotten hurt his season would be even better and he'd likely have 20 goals by now. Bit concerning is the lack of assists but I think the overall lack of talent on the flames plays a huge part in that. Really hard to have a lot of assists when you are the second worst offensive team in the league. Still has some development to do as yes he scored twice but Perrons goal was also his fault but that's expected of a young player but yes I an very impressed with how Monahan governs himself and how much of a pro he is. I agree that Monahan will excel in the future. I think that having to carry his junior team helped him grow up faster. He also just has that mindset to push himself harder. Backlund shows times when he really pushes himself, but he and Baertschi seem to me to spend too much time letting their natural skill do the work for them. Backlund has definitely picked up the work ethic this season under Hartley. If Backs can continue his work ethic then I think he will keep improving. If Baer can pick up that mindset he can be very good. I think his time in Abby is showing him the need to work hard and hopefully Ward can make sure that work ethic becomes instilled in him. SO far Mony is money. In the next few seasons he could be amazing if he keeps working at it. The IQ is there, now get him the right complimentary players and let him develop without pushing him too hard. I am really looking for Monahan to improve his defensive game. He was advertised as a Toews like player. A guy who can put up decent points but he can do it while shutting down the other teams top players. Nothing to worry about in a teenager. He is having a strong rookie season. But that is where I am looking for progression. I remember reading somewhere that Backs has a personal Hockey Development Coach. I don't remember his name or anything but I remember that this coach told him to hang on to the puck a bit longer before making the plays. (something like that) That was around the time that Backlund had a few criticisms early in the year and was just beginning to show improvement. Some of the credit would then have to be given to this coach and not all kudos going to the Flames CoachingStaff. I don't remember his name either, but he works with a number of hockey stars. Backlund, the coaching staff, and his private coach all deserve praise. So does Stajan. If Stajan didn't get hurt the opportunity may never have been given to Backlund. If the indication i going after Baertschi is not the issue. Part of the process i do when assessing an athlete is their maturity level and drive factor of each. Indicators are that Mony is far more mature than Sven or Backs which is why the difference now and in the future. You can tell an individual they are good but until they believe they are, it is just hot air. Thx Kulstad, that is exactly the article I had read and was referring to. I thought as much. I originally posted it over here (http://fans.flames.nhl.com/community/topic/19215-mikael-backlund-term-and-how-much/?p=638028) in Feb. While watching this game against SJ I think I see a good comparable for what Monahan can become in Logan Couture. Couture is a two way center who has a knack for scoring goals, played junior for the Ottawa 67's and put up 78 points in his draft year, the biggest knock on Couture was his speed. If Monahan can develop into a Couture or better I would be very happy. I am hoping that Monahan becomes a Monahan... No seriously.. Really !! All I can say is... I can't wait to see what Monahan develops into as he grows and gains experience. I think it's awesome that Moneyhands finally broke through the 20-goal plateau (20g 12a 32pts) very respectable numbers for one of our prospects. Let's hope he kepps building on this going forward. Shoot for the moon Sean! Congrats on 20 goals Sean. That's what was wrong with Sven too. (Feaster and some fans) anointed him the next Iginla (team leader/his team). Not the same but similar. Let the kid grow and just be himself. Bet that goal felt good! Now that bagged the elusive # 20 hopefully he'll be able to roll it into a streak and end the season full of confidence. Good on Hartly expanding his role to the PK in addition to his PP time, slowly polishing our already bright young star. Not to beat a dead horse, but drafting within the CHL-pool, particularly the OHL, in the 1st round is a proven approach. Monahan, looking entirely like affirming that philosophy, like it's something new. Most of the time that generalization works. In the odd draft like 2006 you have a Jonathon Toews smiling @ you in the #3 spot. But that is definately the exception. Most of the time it is those from the CHL (all 3 divisions) that are closest to NHL ready. How long did the Flames draft outside of the OHL? Wasn't it something they never went after? It kind of hurt the team's drafting record during the Sutter era right? They drafted out of the OHL a fair bit under Sutter and many of then not so good. Pelech, Nemisz, Ryan Donnaly, Jamie tardiff, Dan Ryder, John Armstrong for example. They were very WHL based under Sutter and they did snag Tj Brodie out of the OHL. Fringe NHLers abounded aplenty from our scouting dept. I think it was 3 guys getting together for pops at the Memorial Cup tournament.